The habit of taking snuff, which reached its peak in the 18th century, was by all accounts a rather miserable affair. The inevitable sneezing, blackened nose, and the necessity of keeping a handkerchief close might have been enough to keep the practice among to the lower classes. 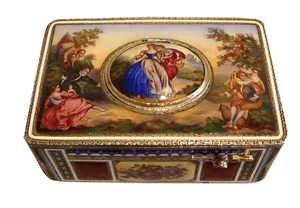 However, craftsmen from across Europe saw an opportunity and began to produce exceptional snuffboxes that were only affordable to the very wealthy. 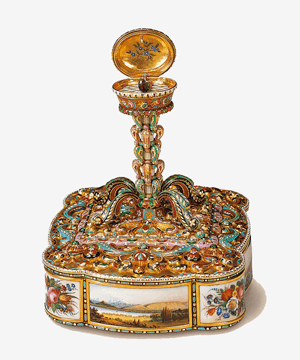 Gold snuffboxes were enamelled, mounted with precious hardstones or gemstones and were often gifted to, and by, heads of state. Consequently they became an essential accessory for the elite, and thus snuff taking became fashionable among the upper tiers of society. An object whose existence is partly thank to the popularity of snuff is the singing bird box. 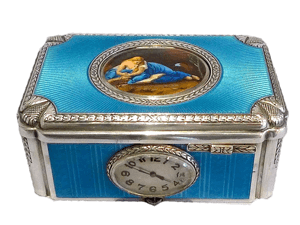 These tabatiere (a French term which has come to describe any small decorative box which resembles a snuffbox, but was not necessarily intended for snuff taking per se) are a wondrous marriage between the skill and ingenuity of the watchmaker and the talents of the goldsmith and enameller. If you have a singing bird box that you would like to sell or have valued then we can help. This guide will act as a good starting point, helping you understand what to look for and why prices can vary so much. It is unsurprising that the development of the singing bird box is credited to one of the most famous automata makers. 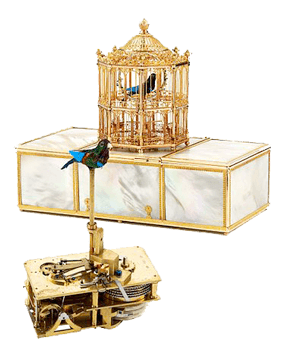 Pierre Jaquet-Droz, born in Switzerland in 1721, had by the end of the 18th century been making singing bird cages. These were the predecessors of singing bird boxes, and share many of the same components in a slightly larger form. These cages feature flapping birds who seemingly jump from one perch to another and whose song could almost be mistaken for a real bird’s song. In these early cages the notes were made by a miniature pipe organ, requiring a separate pipe for each note. Jaquet-Droz and Jean-Frédéric Leschot miniaturised this aspect of the movement by substituting the pipes for a chamber whose size altered thanks to the movement of a small piston, allowing different notes to be produced. Essentially every singing bird box has the same fundamental features: a mechanical power train, a series of cams, the bird, and the box. The power in the earliest movements (circa 1790-1860) comes from a fusee whereas those later are often going barrel movements. The cams are the brains of the boxes, and convert the rotational energy into linear movements. The bird itself is a marvel of engineering and is quite often the most difficult part of the box to restore. Finally the box is the veil that hides the surprise within, and would eventually be made from almost every material from gold, to silver gilt, to tortoiseshell to Perspex cases available on today’s modern boxes. On the outside of each box is a small slider, often located to the top right on the front panel. Sliding this activates the movement and split seconds later a small (1.5cm high) bird appears from underneath a hinged flap on the cover, more often than not surrounded by a finely pierced grille. The bird then begins to turn its body, flap its wings and tail feathers, move its beak in time with the birdsong and on the very best models, turn its head from side to side. Once the bird’s performance is over, it disappears as quickly as appeared. The whole process is controlled by a stack of cams inside the movement, the number and complexity of which correlates to the performance of the bird. The cams also control the bellows, which in turn provide a constant flow of air to the whistle, and the piston within the whistle, to create the imitation of the birdsong. The cams are often in stacks of eight, with four controlling the movements and four controlling the position of the slider. The movements in the finest boxes are able to transition from one cam to another seamlessly, quite often repeating and mixing the sequence of a single cam ( i.e. 1-1-2-3-2-3-4) to create a very natural and varied song. 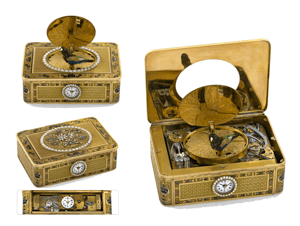 These early and complex Swiss boxes often produce a 30 second performance, the bird moving powerfully and with purpose owing to the fusee movement. Later boxes typically have a 15 second performance and can sometimes lack gusto as by this time the focus centred on the elaborate decoration of the case at the expense of the movement. Singing bird boxes were a Swiss invention and the earliest and finest boxes were all crafted in Geneva. 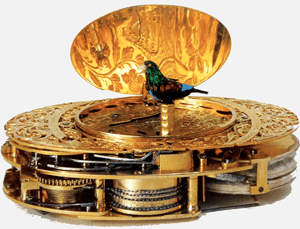 Along with Pierre Jaquet-Droz and Jean-Frederic Leschot (who were the earliest pioneers in the field), Jacob Frisard was an important innovator and is credited with creating the mechanism that retracted the bird beneath the cover once the performance was finished. Arguably some of the finest singing bird tabatiere were produced by Freres Rochat (Brothers Rochat), the three sons of the master watchmaker David Rochat. 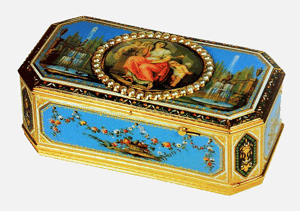 They produced superb boxes until around 1849. Charles Abraham Bruguier is another Swiss name who added considerably to the art of singing bird boxes by not only improving the sound of the whistle, but also by extending the length of play to around 30 seconds. Bruguier’s movements are signed C Bruguier a Genve and are stamped with a number, and he also chose to work with some of the best enamellists of the time to produce lavishly decorated gold cases. A Bruguier characteristic, which was widely imitated, was the enamelled spray of flowers on the inside of the hinged cover. Confusingly, Bruguier’s son was also named Charles Abraham Bruguier and he continued in his father’s footsteps and marks the end of golden age of singing bird boxes (1785-1885). 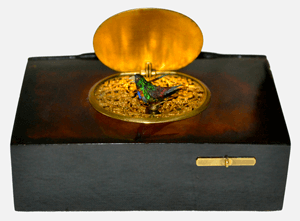 Blaise Botnems was born in France in 1814, and although trained as a master clockmaker he went on to specialise in the production of mechanical birds and singing bird boxes, starting his own business in 1849. As with many labour and skill intensive crafts in the 19th century, the complex mechanisms of the bird box were to undergo drastic changes, many of which are credited to Botnems. Instead of the powerful fusee movement a simple going barrel was used, the eight stack cam was reduced to just two, and the lungs of the bird (the bellows) were also modified and simplified. The changes made by Bontems were not necessarily to the detriment of the performance, in fact he further improved the birdsong, and his modified movement is still the blueprint for modern singing bird boxes. Such was the widespread appeal and success of his interventions, Botnems won no less than 43 gold, silver and bronze medals at Universal espositions, and were even suppliers to HRH the Queen of England. Bontems boxes are often housed in tortoiseshell cases, a material which when steamed could be formed and joined into a seamless edifice. Picking up where Bontems had left off, the firm of Karl Griesbaum (1872-1941), founded in 1905, originally produced clock parts, but soon went onto specialise in the production of singing bird boxes and were the dominant producer in the 20th century until they closed in 1988. Griesbaum boxes featured only one song and one movement, although the movement was offered in three build qualities. However, with over 30 different case styles available the movement was often a secondary consideration. Even if the highest level of finish was applied to the movement the performance of the bird would still be the same. The cases themselves were made in the manner of the great bird box producers (Rochat, Bruguier etc) and were available also in different grades (silver gilt, gilt brass, silver etc). The feathers of exotic birds were often used to ‘dress’ the mechanical birds. With the ever increasing list of endangered birds careful consideration is needed before importing or exporting any singing bird box. It has been known for American authorities to demand proof of which bird each feather was originally from – a near impossible task – before either allowing the box to enter the country. As an alternative they have been known to strip each and every feather from its body before allowing it to travel onwards. Further problems can arise as the beaks are often made of ivory, and with a potential outright ban of the sale of ivory in the UK, the future of the bird box looks uncertain. The value of a singing bird box can seldom be judged from an external inspection alone. Though the quality and complexity of the movement can be judged by a trained eye it will often have to be removed from the case for a final confirmation of value. The complexity and number of the cams has a large impact on the value, as does the inclusion of any further complications such as a clock or a secondary bird. The cases themselves also can also be appraised as works of art in their own right, and it is the combination of both movement and case which produce the final value. Are you looking for a valuation of your singing bird box? If so then we can help. We can help you sell your singing bird box and get the best possible price for it. We sell both through auction and private sales, using the route which will earn you the most money.